Everyone’s favorite snarky, dangerous, idealistic, relentless covert operative is back, and this time he’s brought friends. 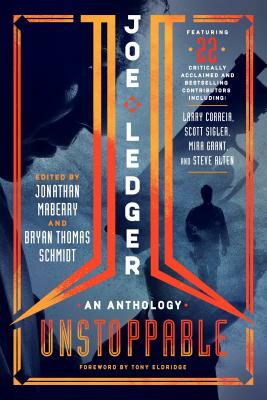 Joe Ledger: Unstoppable presents original short stories about Joe Ledger and the Department of Military Sciences by some of New York Times bestseller Jonathan Maberry’s "friends in the industry." Buckle up for powerful, exciting, and nail-biting adventures by Seanan McGuire, Scott Sigler, Larry Correia, Weston Ochse, Steve Alten, David Farland, Aaron Rosenberg, James A. Moore, James Ray Tuck, Javier Grillo Marxuach, Jennifer Campbell-Hicks, Jeremy Robinson, Joe McKinney, Jon McGoran, Keith R.A. DeCandido, Nicholas Seven, Bryan Thomas Schmidt, P.G. Charles, and Dana Fredsti! Joe Ledger is a former Baltimore cop who was recruited into a secret government agency tasked with stopping terrorists who are using bleeding-edge science weapons. The stakes are always high. If you have to call Joe Ledger, it’s already hit the fan! Bryan Thomas Schmidt is an author and Hugo-nominated editor of adult and children's speculative fiction. His debut novel, The Worker Prince received Honorable Mention on Barnes & Noble Book Club's Year's Best Science Fiction Releases. His short stories have appeared in magazines, anthologies and online and include stories in The X-Files and Decipher’s WARS. As a book editor working for Kevin J. Anderson and Rebecca Moesta's WordFire Press, he has edited books by such luminaries as Alan Dean Foster, Tracy Hickman, Frank Herbert, Mike Resnick, Jean Rabe and more. He was also the first editor on Andy Weir's bestseller The Martian. His anthologies as editor include Shattered Shields with co-editor Jennifer Brozek, Mission:Tomorrow, and Galactic Games for Baen, Space Battles: Full Throttle Space Tales #6, Beyond The Sun, andRaygun Chronicles: Space Opera For a New Age. He is also coediting anthologies with Larry Correia and Jonathan Maberry set in their New York Times Bestselling Monster Hunter and Joe Ledger universes. From December 2010 to June 2015, he hosted #sffwrtcht (Science Fiction & Fantasy Writer's Chat) Wednesdays at9 pm ET on Twitter as @SFFWRTCHT. Find him on Twitter and Facebook as @BryanThomasS or at his website: www.bryanthomasschmidt.net.